Head Study 2 - 8 in. x 10 in. Oil On Panel - BID ON OR BUY THIS PAINTING. This is a quick head study of a man. I thought that I would do some of these periodically over the next few weeks. Head Study 1 8 in. x 10 in. 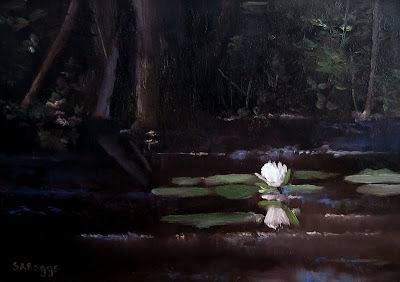 Oil On Panel - BID ON OR BUY THIS PAINTING. This is a head study of a woman. I thought that this week I would do a few of these as daily paintings. I hope that you enjoy it! Christmas Ornaments 5 in. x 7 in. 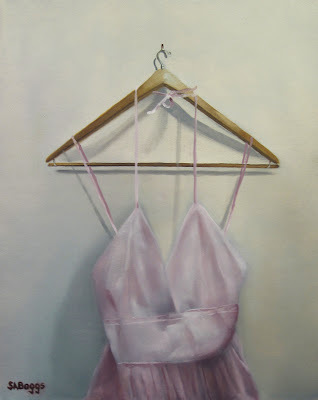 Oil On Panel - BID ON OR BUY THIS PAINTING. 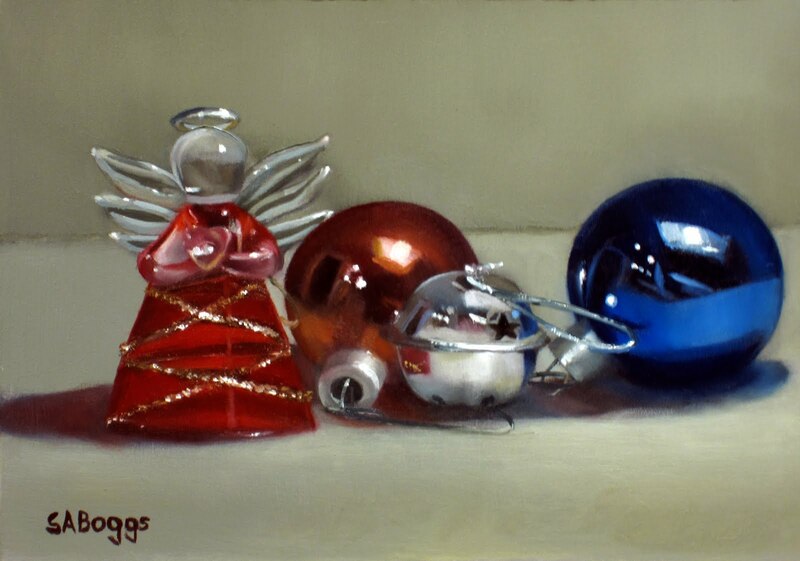 This is the first time that I have created a painting with Christmas ornaments. These are a few of the ornaments that we use on our tree every year and I thought that the idea of using them was interesting. The composition is built around a lot of light, shine, and reflection. Because of all of the detail this painting isn't technically a daily painting, it took a couple of days to finish this one up. I hope that you enjoy it! Green Apples And Pear 5 in. x 7 in. Oil On Panel - BID ON OR BUY THIS PAINTING. 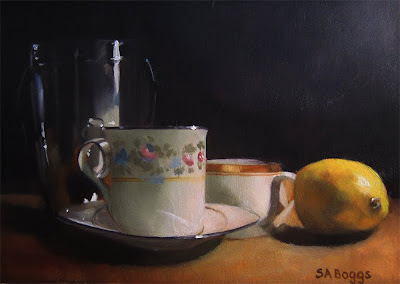 I haven't created a painting in chiaroscuro (objects surrounded and emerging from shadow) style in a while and I thought that this was a good subject for it. This composition is a little different for me also. I typically have the light originating from the right and the largest object in the composition on the left. 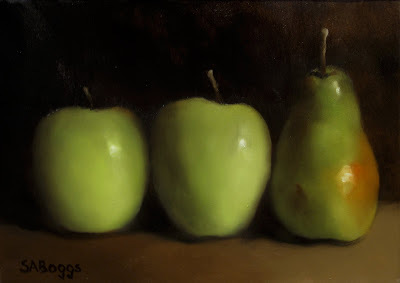 For this painting I have the light from the right, but I have the largest object on the right and the size of the apples diminishing toward the left. I really like the painting. I hope that you enjoy it too! 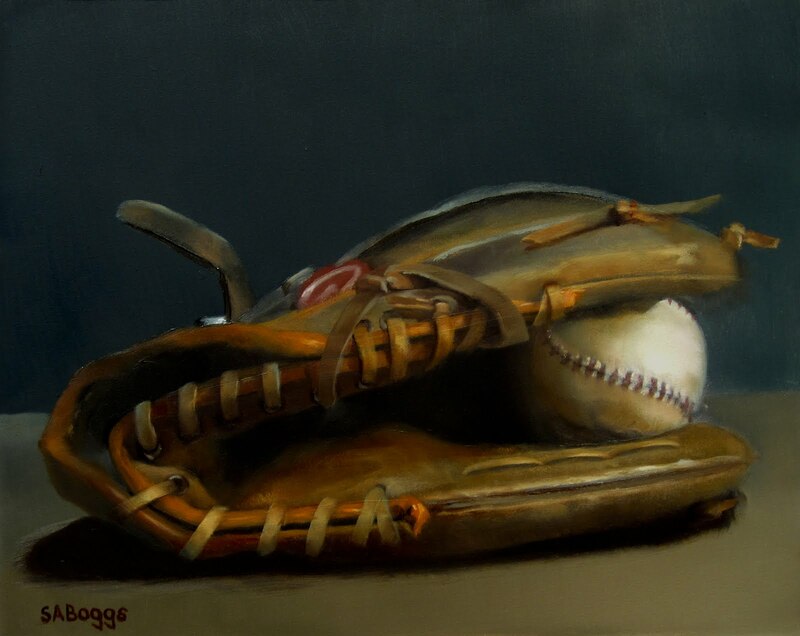 The subject is a baseball glove and baseball. This is actually my glove that I used for years. I had really enjoyed painting a pair of leather work boots the other day and I was talking to a friend about it and he suggested that I do the glove. I'm really glad that I did. It was a very fun painting to create. I placed the glove in a natural light setting which I think gave it a nice feel without any forced drama from heavy shadows. To me it kind of looks like it was just dropped there after someone used it. I hope that you enjoy the painting! The subject is a pair of my old work boots. I have had different pairs of boots like these constantly since I was probably five years old. 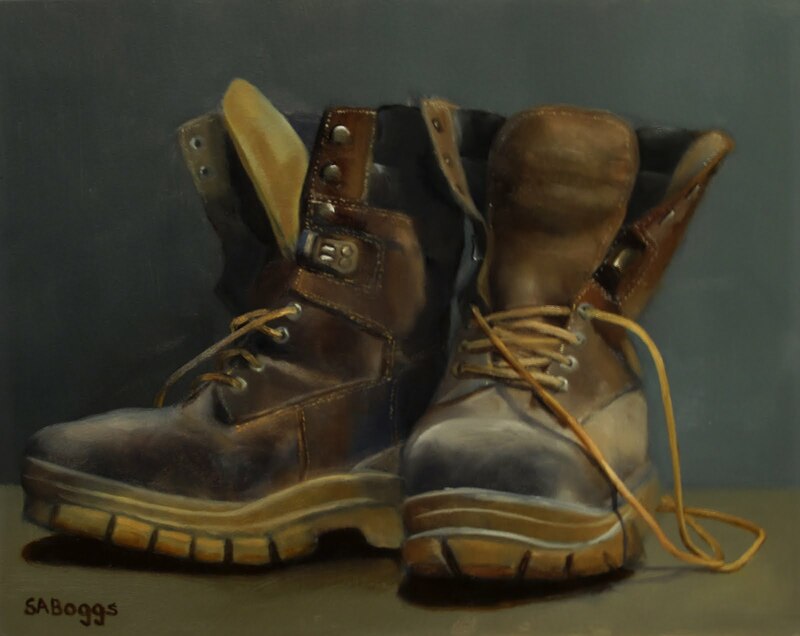 Paintings with boots and shoes as the main subject are pretty common historically in art. I think that Wyeth with 'Trodden Weed' or Van Gogh with 'A Pair Of Shoes' probably have done them the best (just my opinion). I've only done them once before in a drawing when I was in art school long ago. This painting actually took me two days to complete, so it is technically not a daily painting, but after finishing this I have to say that I'm really happy with it. I hope that you enjoy it too! Thanksgiving 8 in. x 10 in. Oil OnPanel - BID ON OR BUY THIS PAINTING. The subject a pumpkin on a silver serving platter. After I finished the painting something about it made me think of Thanksgiving day. 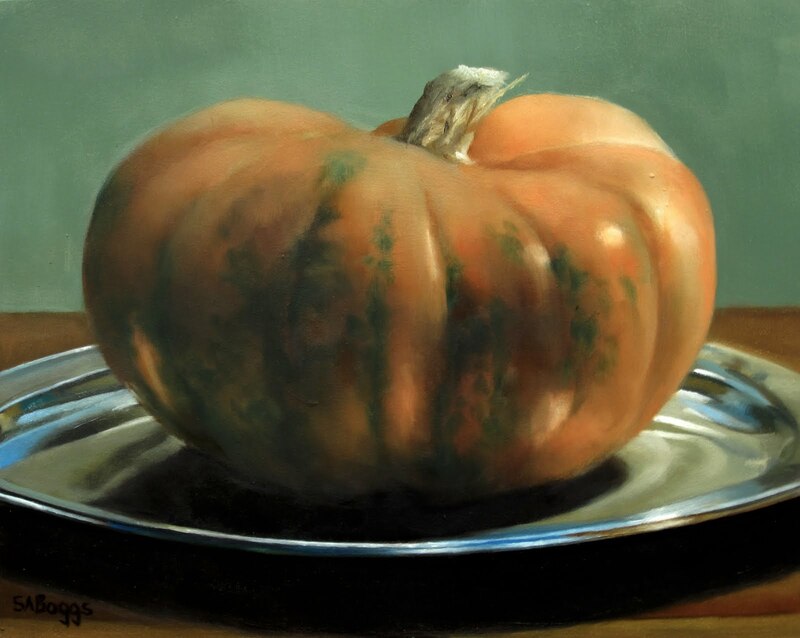 I don't know if it was the platter or the fall pumpkin, or the colors, but that is what this painting reminds me of. From a compositional perspective I liked the oval pumpkin, the oval platter, and the oval shadow contrasted against the rectangular table and wall. I hope that you enjoy this painting! Five Pumpkins 8 in. x 10 in. 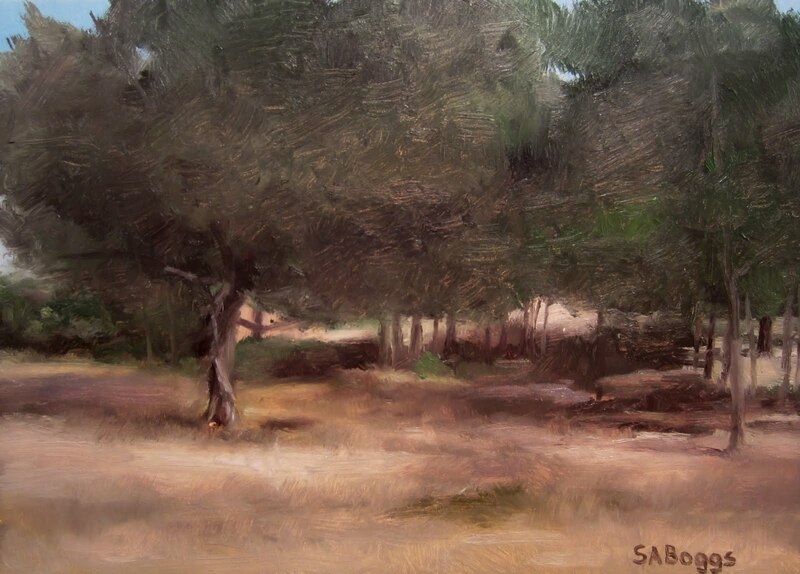 Oil OnPanel - BID ON OR BUY THIS PAINTING. The subject is five pumpkins that I had left over from halloween. 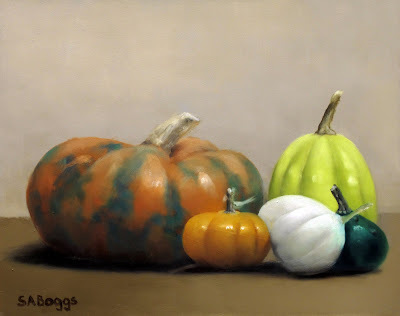 I really like painting them and I thought that the variety of colors and sizes of each of the pumpkins made for an interesting composition. I hope that you enjoy it! Commissioned Portraits 20 in. x 24 in. 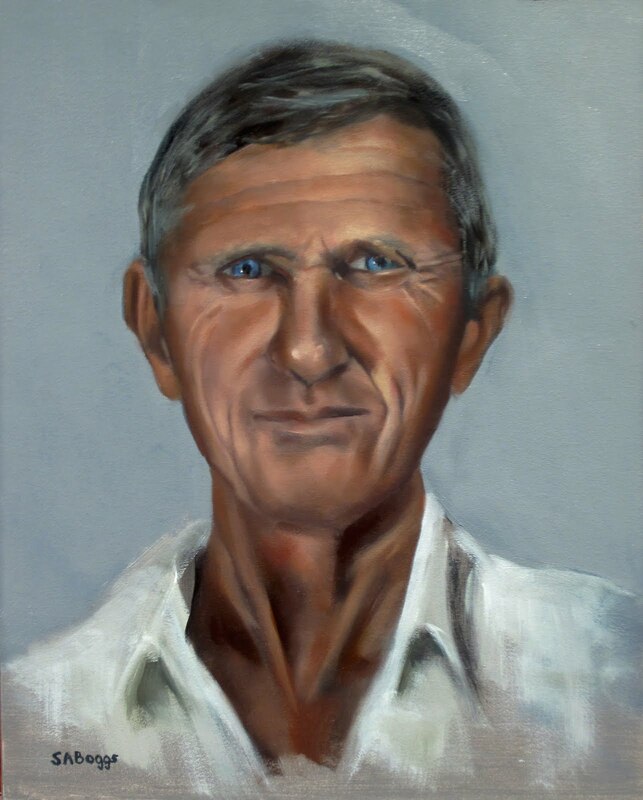 Oil On Linen Canvas - COMMISSION A PORTRAIT. Commissioned head and shoulders portrait. Select the link above if you are interested in commissioning a portrait. Tin Barn 16 in. x 20 in. 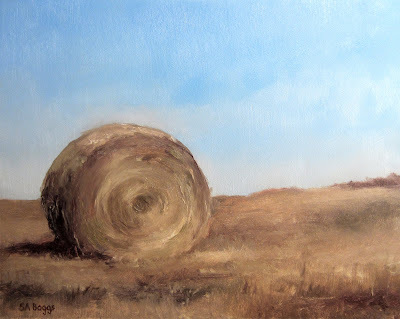 Oil On Linen Canvas - BID ON OR BUY THIS PAINTING. 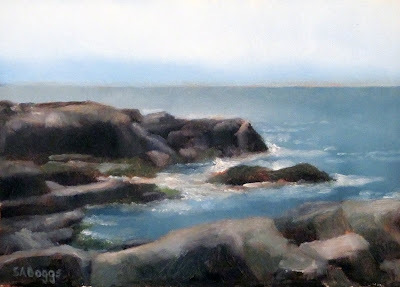 THIS IS A FULL SIZED PAINTING, NOT ONE OF THE SMALLER DAILY PAINTINGS THAT I TYPICALLY LIST ON EBAY. This is an old red tin barn in a field down the road from my house. The farm is probably a hundred acres, mostly fields that they raise goats on. 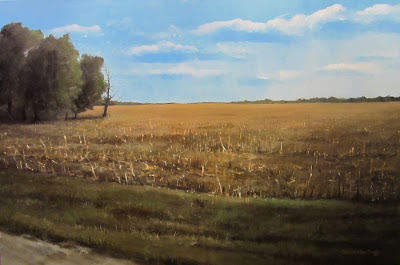 I have driven past this scene many times and always wanted to paint it. This day had nice Fall sunlight across the field and barn. 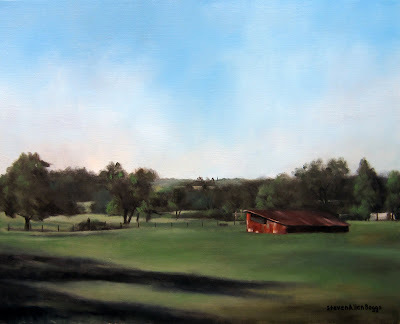 I really liked the red color and shape of the barn, and of course the sunlight on the field. I hope that you enjoy the painting! Another commissioned head and shoulders portrait. 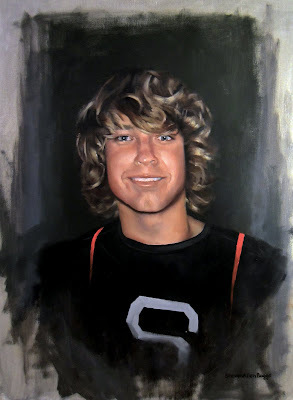 Select the link above if you are interested in commissioning a portrait. 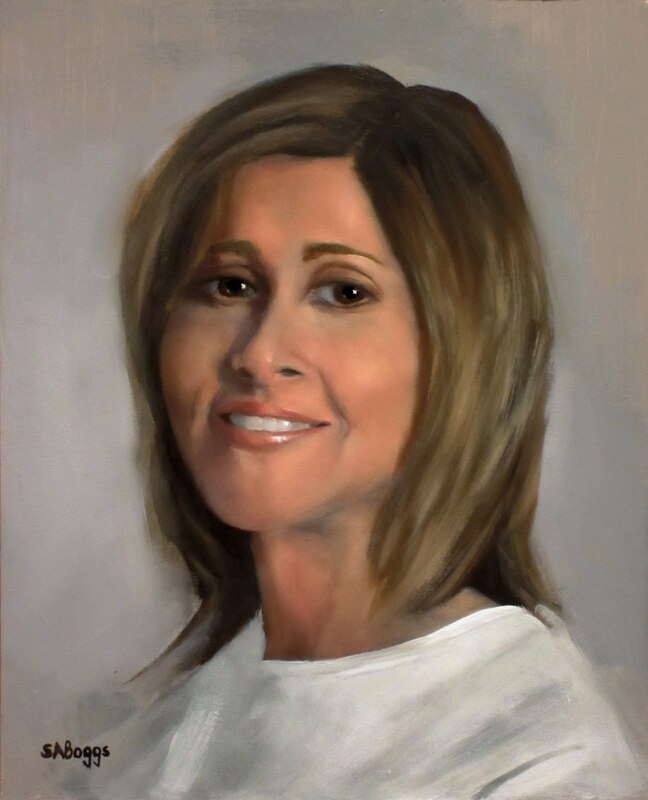 I am currently doing commissioned head and shoulders portraits. Select the link above if you are interested. Early Fall Tree 11 in. x 14 in. 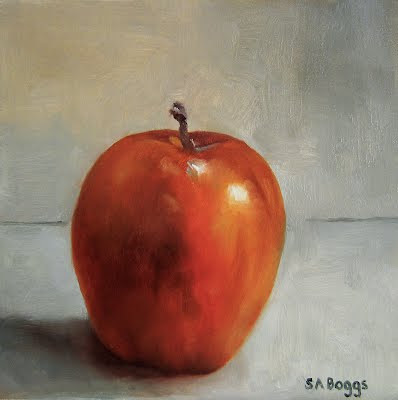 Oil On Linen Canvas - BID ON OR BUY THIS PAINTING. 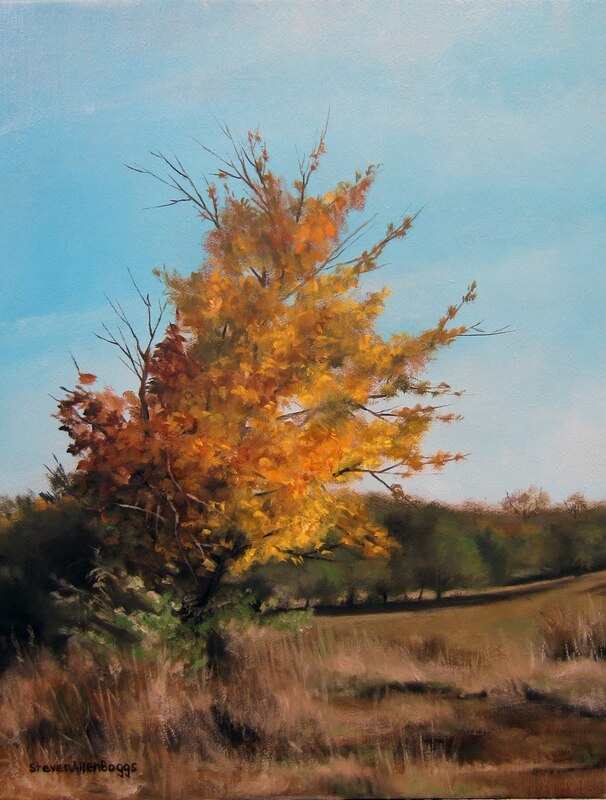 This is a Hackberry tree that is ahead of the other trees in the area with its Fall colors here in Tennessee. I'm always amazed at what interesting things are around us when we take the time to look for them. This tree and field were right off of a relatively busy side road that leads out into the country. I almost didn't even see it when I was driving. I really liked the contrast of the colors in the tree against the field where most of the trees in the distance are still predominately summer green. To be honest I really like this painting, I hope that you enjoy it too! Before Halloween 18 in. x 24 in. 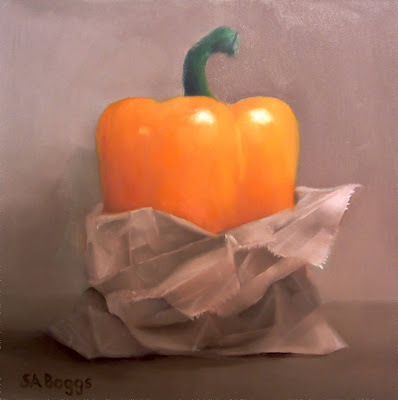 Oil On Linen Canvas - BID ON OR BUY THIS PAINTING. 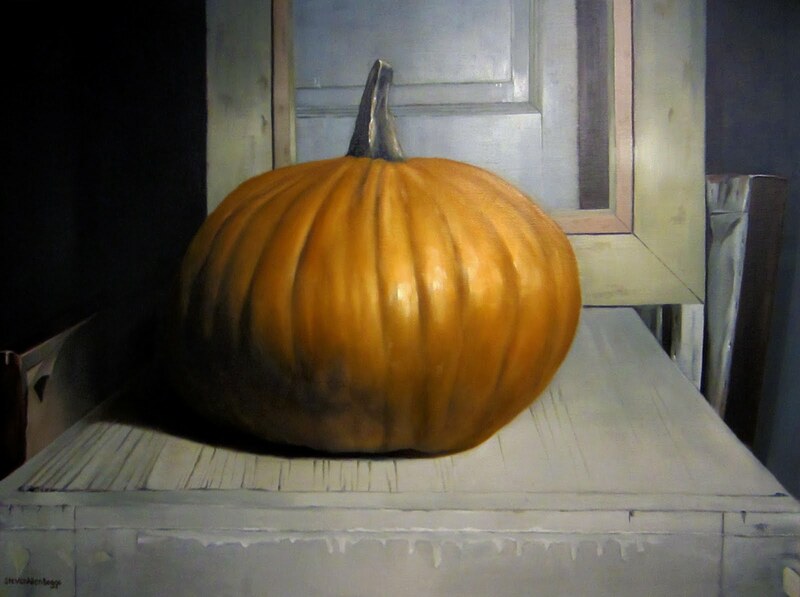 This painting is of a pumpkin sitting on an old cabinet in my studio. Pumpkins are one of my favorite subjects and every Fall I try to do one or two paintings of them. 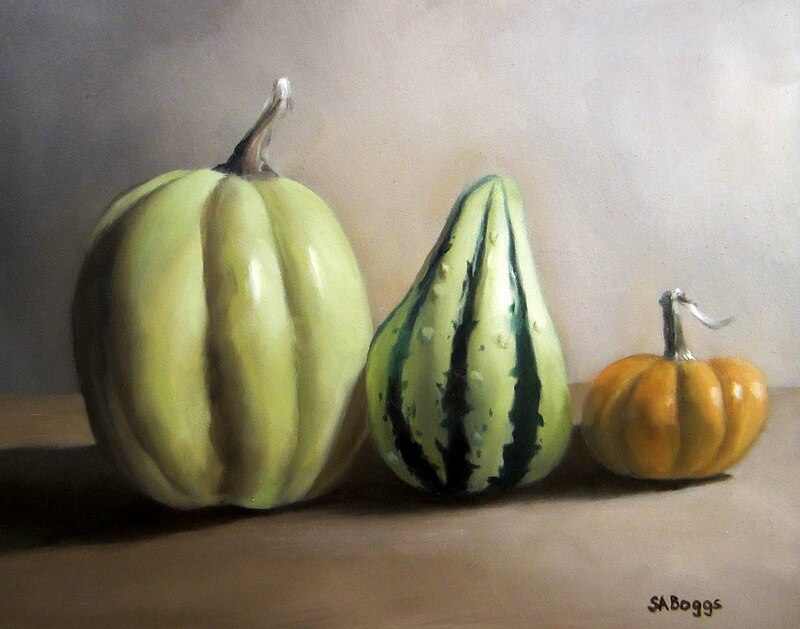 From a compositional perspective this painting was all about the shapes. There are squares and rectangles reflected throughout, and the only thing in the painting that isn't composed of right angles is the pumpkin. Very fun to paint. I hope that you enjoy it! Summer Harvest 20 in. x 30 in. Oil On Linen Canvas - BID ON OR BUY THIS PAINTING. 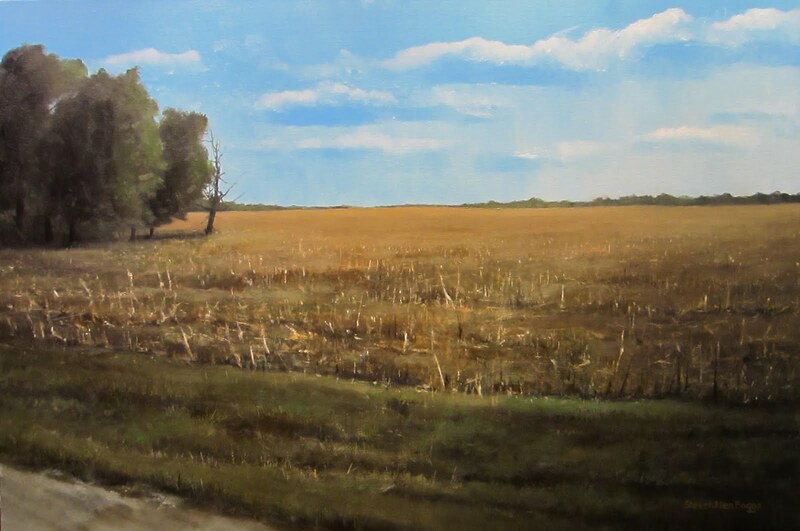 This painting is of a corn field in Kansas that is across the road from one of my family members. For me there is something attractive and strangely comforting about these fields after the corn has been harvested. I especially like them in the winter when they are covered with frost and snow. This field was harvested this month. 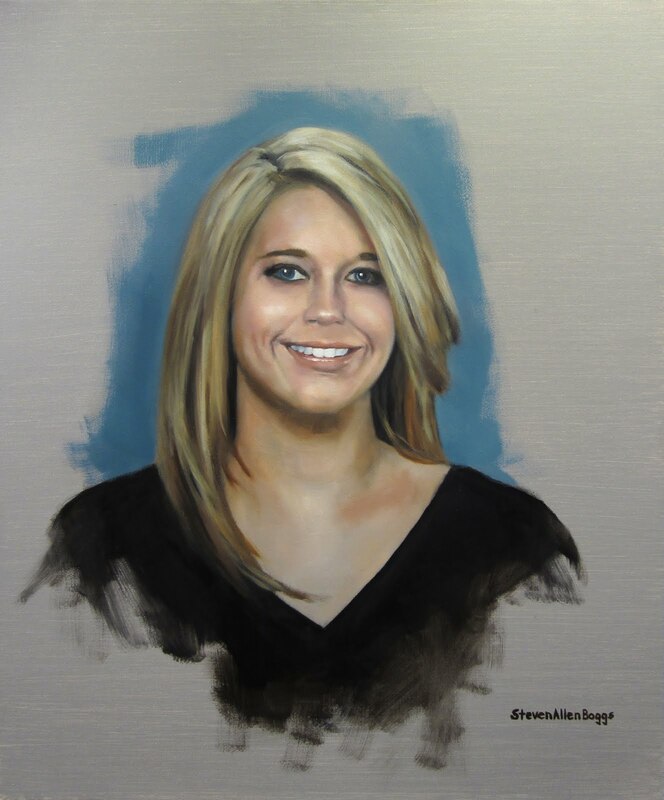 The setting for the painting is in the afternoon around 5:00pm. I was most attracted by the reddish gold colors of the field created by of the remaining corn stalks. I hope that you enjoy the painting! 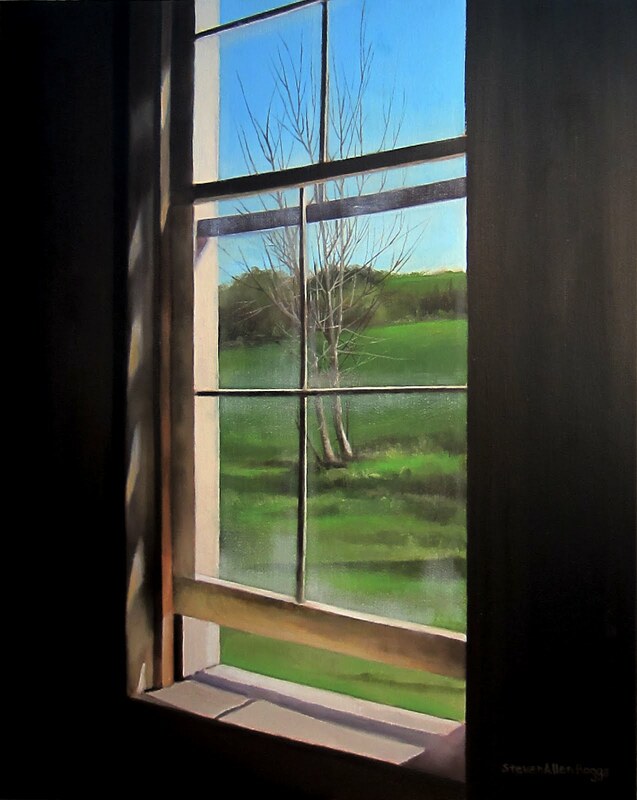 This painting is of a window in a cabin in the Smoky Mountains, the cabin is well over 100 years old. The painting is somewhat of an abstract to me, its all about the squares of the window panes, and the rectangles of the walls, window frame and sill. But it was the sunlight in the window that originally attracted me to it, the light was very intense and it darkened the inside of the room around the window. The glass panes are old and frosted from time around the frames. I really liked the idea making the window the main subject of the painting and not using the cabin walls or furniture and reducing the window to a secondary role. I hope that you enjoy it! 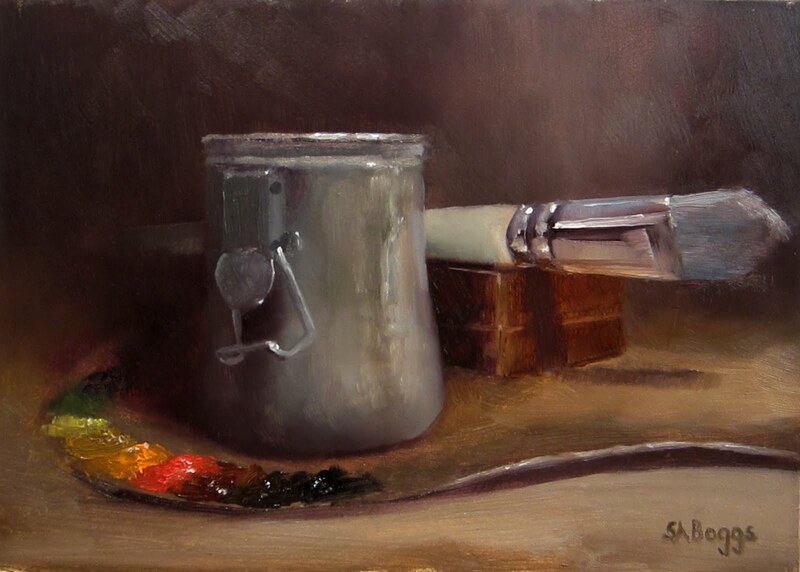 This painting a composition of several things that I like to paint. I've been painting apples and bottles for years and for this painting I added the clay jug because I thought that it gave a nice contrast to the smoother glass of the bottle. I tried to use as much natural lighting in the painting as I could, and used a grayish background to help emphasize the colors of the subject. I hope that you enjoy the painting! 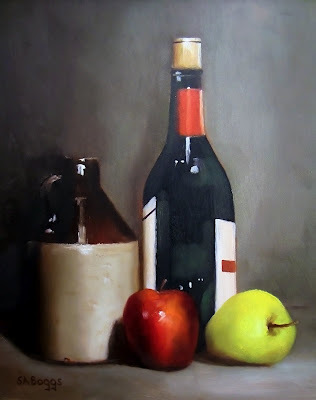 Brown Jug And Apple 5 in. x 7 in. 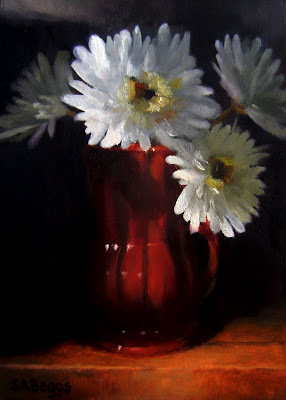 Oil On Panel - BID ON OR BUY THIS PAINTING. This is a brown clay jug that a good friend of mine has. I borrowed it to paint primarily for the contrast between the shiny top of the jug and the matte bottom. 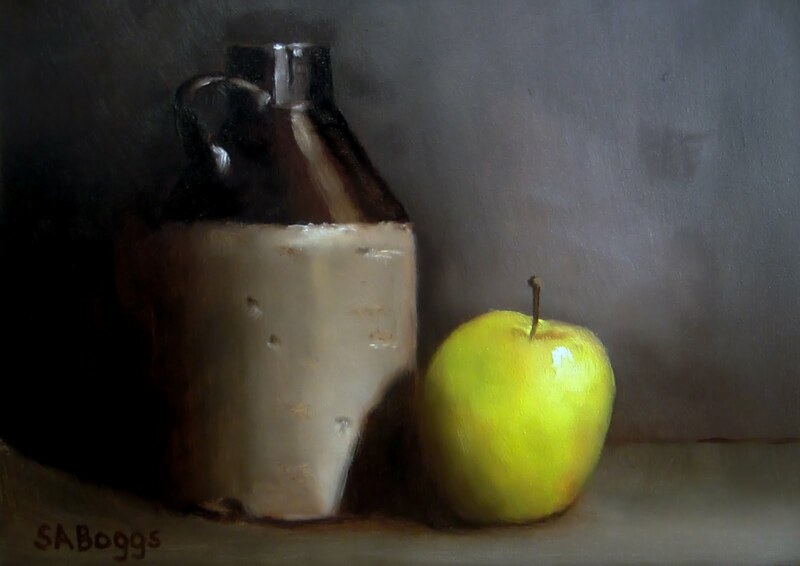 When I set this up I thought that the yellow of the apple really added some nice color to the muted colors of the background and the jug. I hope that you enjoy the painting. This is bakery bread from a local grocery store. I had painted doughnuts once but never bread and I have to say that it was really really fun to paint. 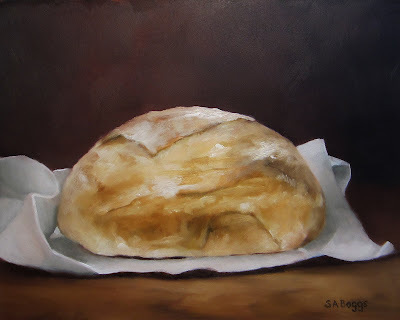 I used a more diffused light than normal for me when setting this up, and placed it in front of a dark maroon colored background to bring out the golden colors in the bread. Very enjoyable day painting this. I hope that you like it too! These are very small roses in a Mason Jar. The roses came from a plant in our backyard. My wife picked them when they opened over the weekend, put them in the jar and placed it on the kitchen table. This was probably a set-up by her for me, but I saw them this morning and decided to paint them. 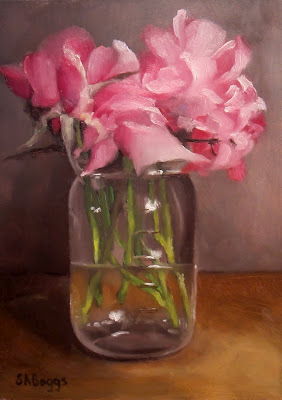 I really enjoy painting glass so for me this was a fun painting to work on. I like the pink of the flowers against the grayish background. I hope that you enjoy it. Tomatoes In A Bowl 8 in. x 10 in. 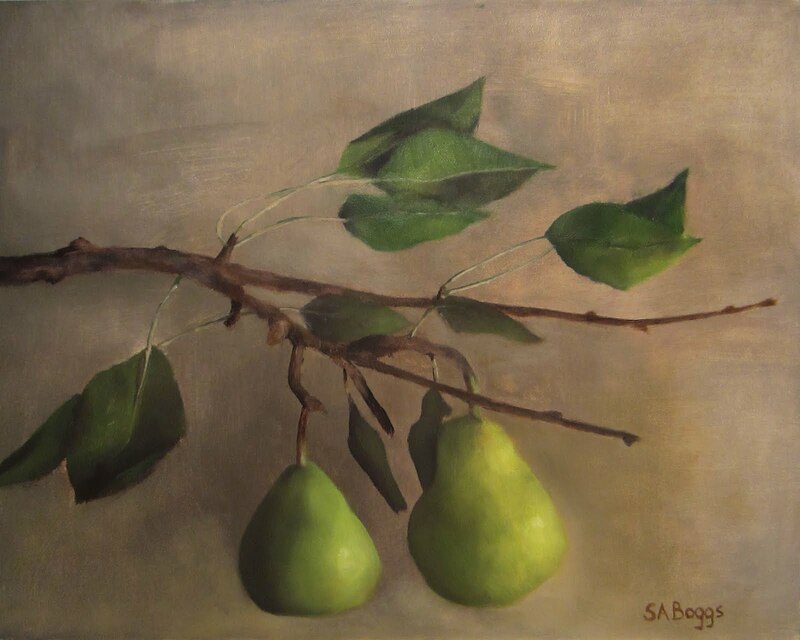 Oil On Panel - BID ON OR BUY THIS PAINTING. These are more tomatoes from my son's plants. The idea of putting them in the fiesta-ware bowl was my wife's, and it turned out to be a good idea I think. 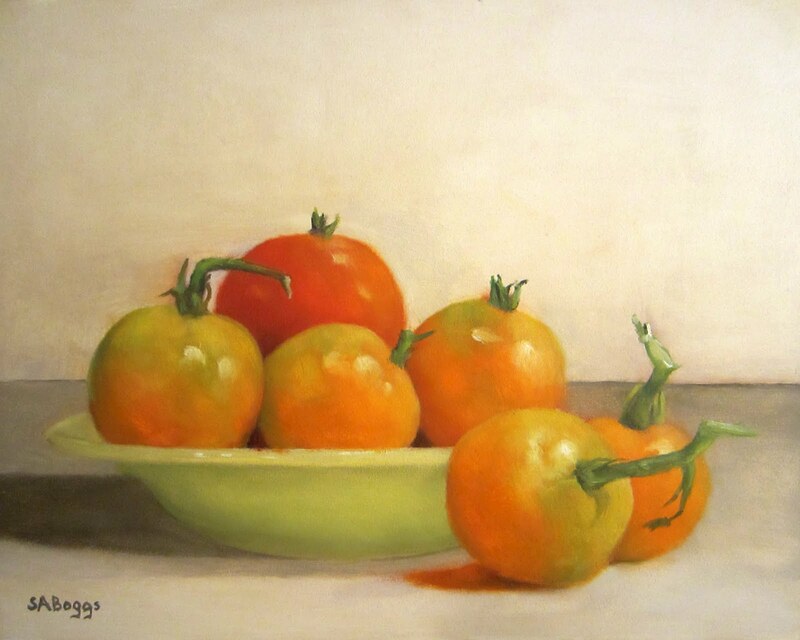 I wanted this painting to be a reminder of summer, so it needed to have a lot of light and I think that the yellow bowl really helped to brighten everything up even more. I'm really happy with the painting, I hope that you like it too! 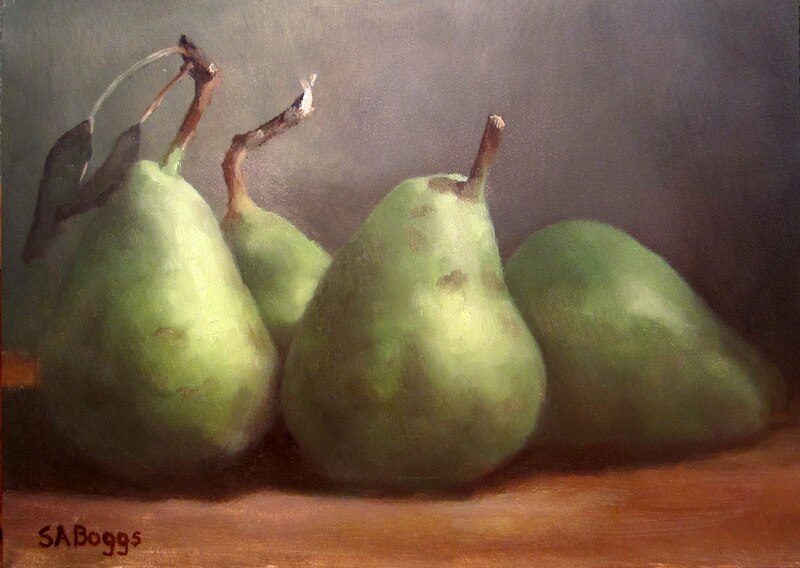 Pears On A Limb 8 in. x 10 in. 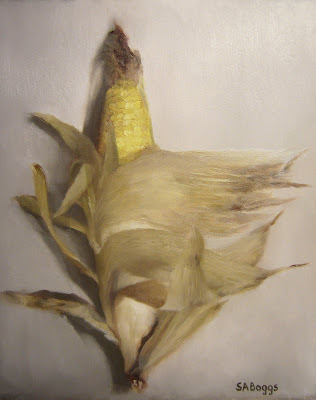 Oil On Panel - BID ON OR BUY THIS PAINTING. These are more pears from my mother-in -law's tree. I took the limb and the pears home to work on this. I originally planned to use a sky blue background on the painting, but after setting this up in the studio I decided on a grayish-green background, and I'm glad that I did. The painting is part still life and part landscape, and I really liked the effect of a studio type background against these pears. I hope that you like the painting too! Bottlenecks 5 in. x 7 in. 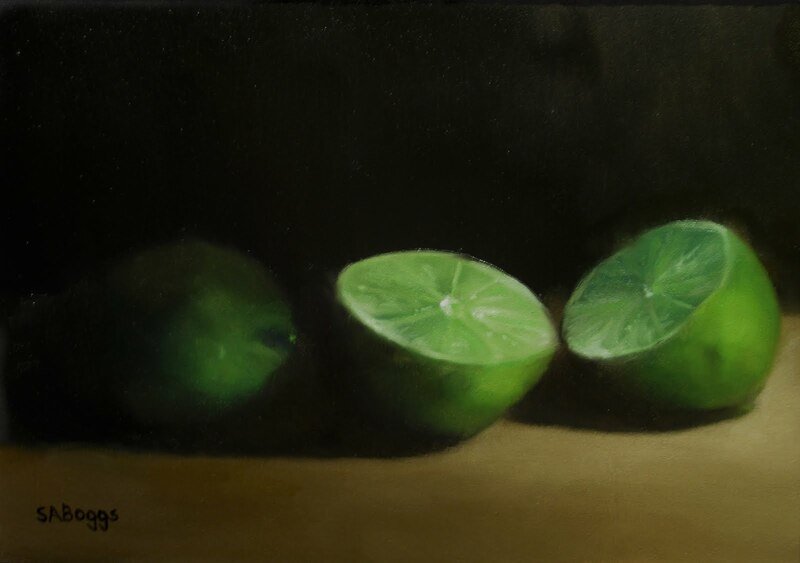 Oil On Panel - BID ON OR BUY THIS PAINTING. 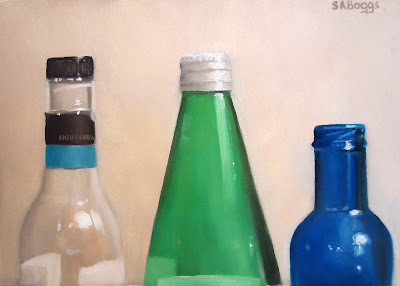 These are three bottles that I had in my studio. I painted this for the contrast in the colors and transparency of the bottles. I thought that painting the top half of them added an interesting effect since unless you know what type they are there is a little bit of mystery to the painting. The bottles actually are port wine, sparkling water, and an energy drink. I hope that you enjoy it. 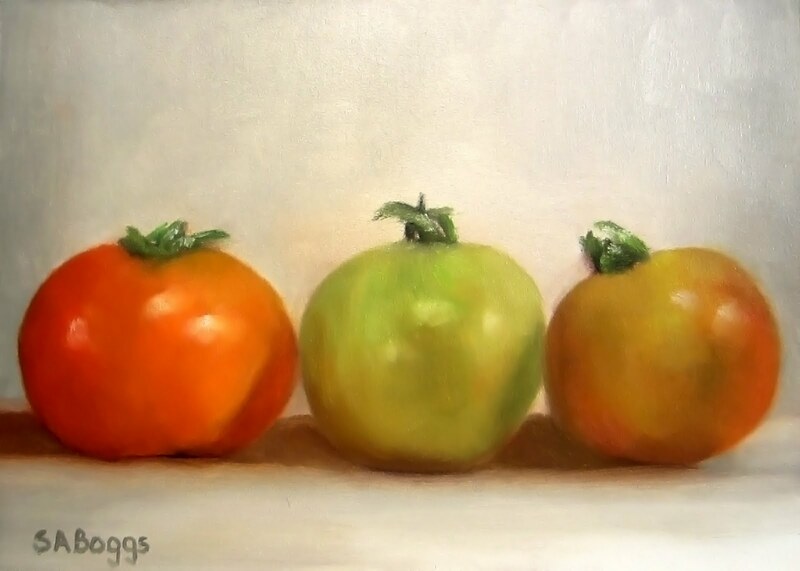 Mango, Plum, And Apricot 5 in. x 7 in. 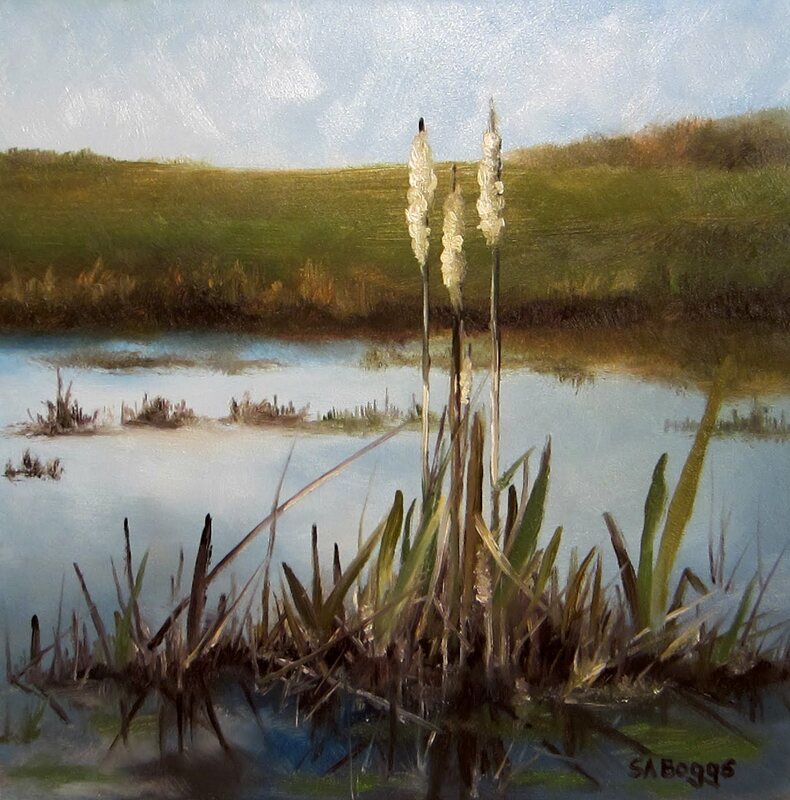 Oil On Panel - BID ON OR BUY THIS PAINTING. 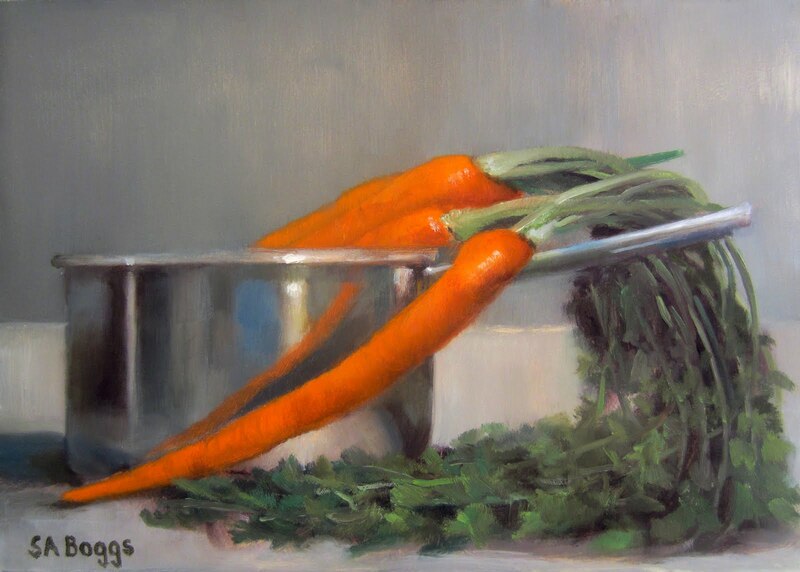 This painting is the result of a trip to the grocery store this morning. 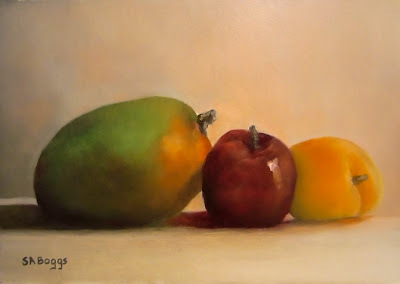 I'd painted a mango and an apricot only one time before and I thought that the the color of the fruit was fantastic. So I put them against a grayish gold-white background to try to enhance the colors. The composition kind of looks like the mango is lording over the little plum and apricot. I'm happy with the painting, especially the colors. I hope that you like it too! These are three tomatoes that came from our small garden. I wanted to paint these primarily because they are in different stages of ripeness. I suspect that the one on the left will be on the dinner table tonight, however it has been forever immortalized in paint! In the end I'm very happy with the result of the painting. I hope that you enjoy it too. Scallion 6 in. x 6 in. Oil On Panel - BID ON OR BUY THIS PAINTING. 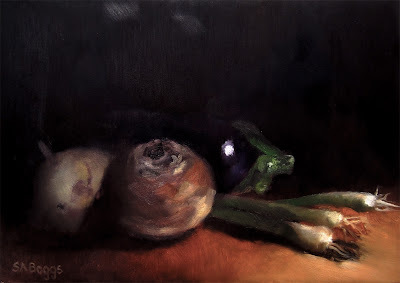 We went to the farmers market yesterday and bought a variety of produce, this painting is of one of the scallions that we bought. To be honest most of the scallions that I have seen were golf ball sized, this one is really large. This is a 6 in. x 6 in. painting and the scallion is just slightly over life sized. 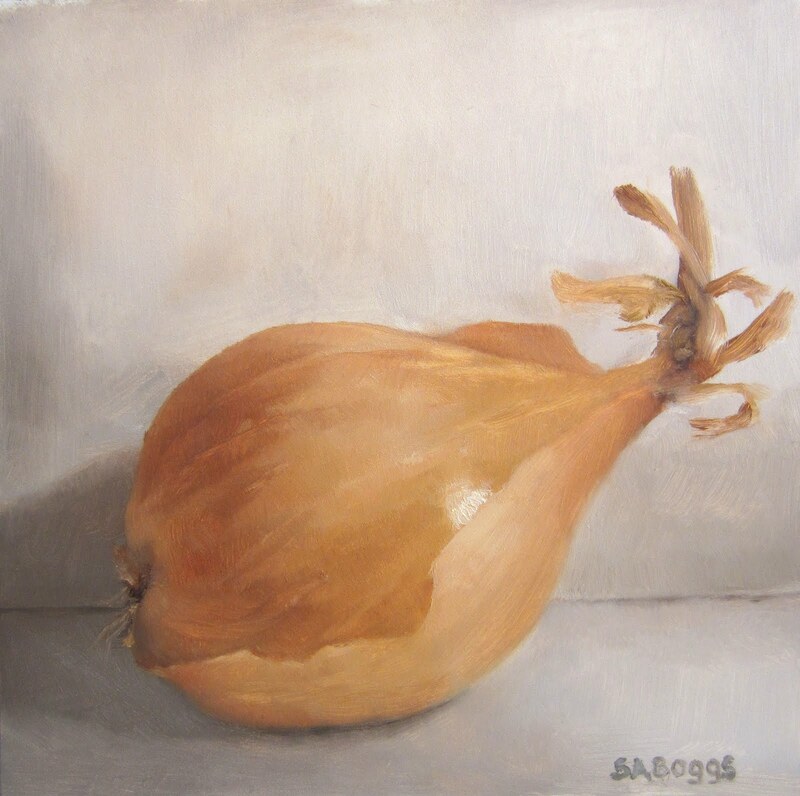 I thought that his made an interesting composition, just one onion in the sunlight with a simple white-gray background. I hope that you enjoy the painting! Summer Field And Grove 5 in. x 7 in. Oil On Panel - BID ON OR BUY THIS PAINTING. This is a grove of trees on a farm about a quarter of a mile from my house. This part of the field has not been mowed and it has been so hot in Tennessee the last week and a half that the grass in the field has turned yellow-gold. This scene was early this morning when the light was good (and it was marginally cooler outside). What I really liked about the scene was the sunlight in the field behind the trees and those nice early morning shadows. I hope that you enjoy the painting. 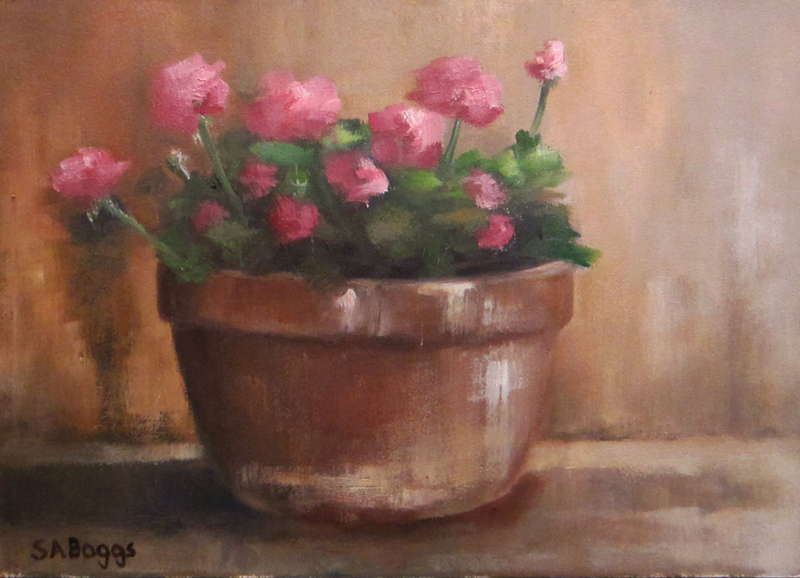 Geraniums In A Terracotta Pot 6 in. x 6 in. 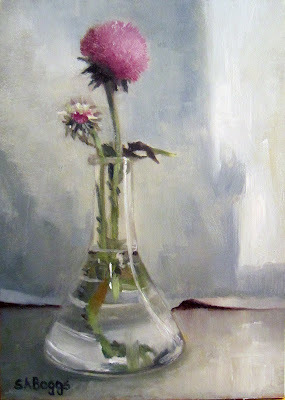 Oil On Panel - BID ON OR BUY THIS PAINTING. 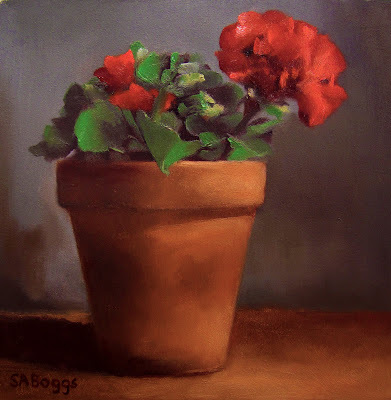 When I first saw those red geraniums I really wanted to paint them. I spent a good deal of time trying to set this up with the right background colors that would allow me to exploit as much of the flower and pot color as possible. 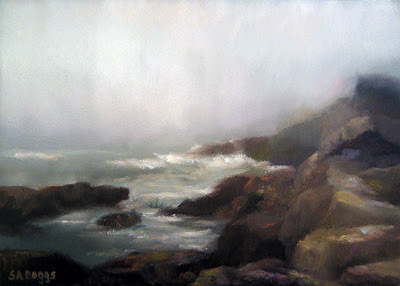 And I really did not want to paint this one with hard, angular light. 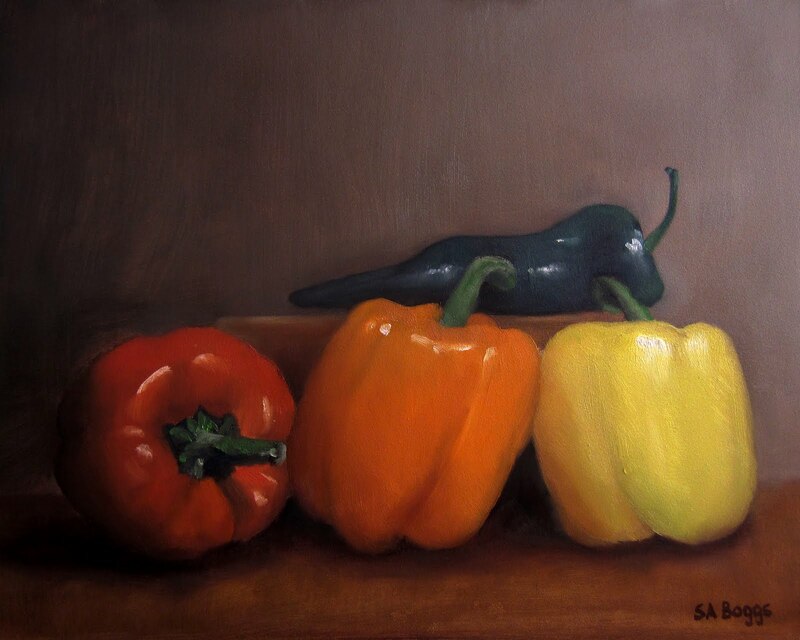 I tried to paint in as much natural, atmospheric light as could. In the end I'm very happy with the result, and I hope that you enjoy it too.